A cow has been named as supreme champion at the Isle of Man's largest agricultural show for a second time. 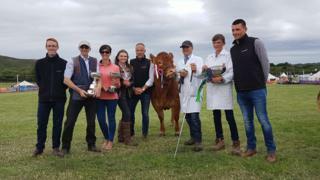 Crosby farmer Lee Cain's two-year-old Limousin heifer won the Royal Manx Agricultural Show's top prize on Saturday, having previously taken the title as a calf in 2016. Mr Cain said he was "absolutely delighted" to have won again. More than 20,000 people attended the show at Knockaloe Farm in Patrick on Friday and Saturday. Image caption Lee Cain said he was "absolutely delighted" to win.